In a previous post I discussed how to expose seeded APIs in Oracle EBS 12 as a Web Service. But, as you can guess, seeded APIs are not always the easiest way to access EBS. For example, the PAY_ELEMENT.CREATE_ELEMENT_ENTRY procedure expects the programmer to take care of EBS specific arguments like element_link_id. Our self service application has logic to submit, approve and check expenses. To do that, it uses employee ids and business rules about submitting, approving and checking steps. Users can view the state, get tasks assigned to them and can save their expenses in the application. This is setup using BPM, business rules, Java and ESB technologies. This application is blissfully ignorant about element_entry_link_ids, date tracking implementations etc. On top of that, EBS does not provide "select" APIs to get data from the application. We don't want to create SQL statements in our application, we like to hide the implementation and use APIs to communicate with EBS. 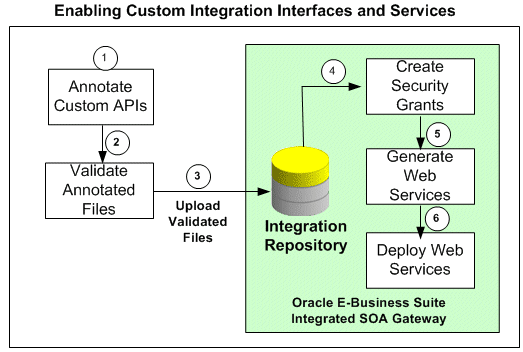 The good news is, Oracle E-Business Suite 12 provides a way to make custom code part of the integrated SOA Gateway. This way you have the best of both worlds: monitoring and control of the services with the Integration repository and usable APIs for external applications. Let's see how that works. Writing and testing PL/SQL code is beyond the scope of this blog and the last three steps were described in the previous post, so I will skip those steps here. There are two roles involved: a system integration developer and a system integration administrator. The 'Integrated SOA Gateway Developer's Guide' describes how the annotations should be added to the package specification in the Chapter 'Creating and Using Custom Integration Interfaces'. Appendix A 'Integration Repository Annotation Standards' describes the annotations in detail. The 'Integrated SOA Gateway Implementation Guide' describes how to validate and upload the files. A system integration developer annotates the API that needs to be loaded in the integration repository. 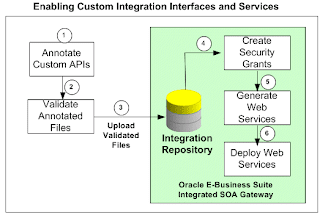 The integration repository parses the source files to populate itself. First of all, you need to annotate the package, with a scope, the product name, the displayname and the category. Secondly, you annotate the procedures that you want to expose as a Web Service. The annotations for the procedure should be placed between the definition and ';'. * This custom PL/SQL package can be used to add pay elements. * this procedure needs to be optimized to use an array for the flex fields. * @param p_element_eff_start_date effective start date of the pay element. The integration repository administrator validates the annotated files before uploading them to the repository. This is done using the Integration Repository Parser, a standalone design time tool. While executing the parser, the annotated source files are validated based on the interface type supported for customization. If no error occurs, an Integration Repository loader file (iLDT) will be created. However, before you can start, you need to setup the environment: install Perl modules and possibly install some patches (depending on the EBS12.x version you are using). If the annotated files were valid, they can be uploaded to the integration repository by someone with the rol integration repository administrator. Not that for an object (or class) that is already present in the Integration Repository, the Integration Repository Loader program reloads the new definition of that object ONLY if the new version is greater than the current version. Make sure you increment the Header version of the target source file. We showed a PL/SQL example here, but the same procedure applies to Java classes, or other supported interface types. Check the developers guide and the implementation guide for a list of supported interface types. As I stated in my previous post, in order to successfully interface with an Oracle E-Business Suite instance, it is critical to cooperate with the developers and administrators of the Oracle E-Business Suite. That way you ensure that the interfaces are both manageable for the people responsible for running and maintaining the Oracle E-Business suite implementation and maintainable and usable for the developers of the self service application. When executed this way, Oracle E-Business Suite becomes a first class citizen of the 'SOA-World' we live in nowadays. This post and 'http://blog.vennster.nl/2012/01/using-soa-gateway-in-ebs-12.html' gives me a big boost into getting our custom webservice up and running. Mark van Uden waves, say hi to Ronald from me.